This website has been designed and programmed according to international accessibility techniques and guidelines, which make its use possible for all types of users, including those with some type of disability. Clarification of the destination of links or hyperlinks: Links offer details regarding the function or destination of the hyperlink and whether the information will be displayed in a new window. Content Ownership Pages are structured with headers, nesting content and making it easier to understand. Technical assistance for reading data tables: Data tables have header identifiers and other technical assistance for the easy interpretation of data by those reading the screen. Breakdown display of website components: Allows font size to be selected to make reading the screen easier, scaling the website and all of its components. 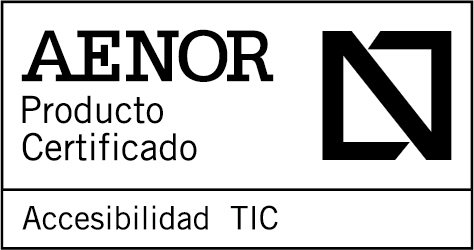 This does not apply to the infoEnergia service accessible from the customer area. Correct site downgrading without style sheet: In the case that a user enters the website through a browser that does not support CSS, the structural framework allows for correct viewing of all content. Pages are structured with headers, nesting content and making it easier to understand. Compliance with the W3C's (World Wide Web Consortium's) WCAG (Web Content Accessibility Guidelines) at the AA level. Guidelines for Accessible Content in Web 1.0.0Level Double-A Validation Seal of Conformity with Web 1.0 Content Accessibility Guidelines. The presentation is based on the Recommendation of the W3C regarding Cascading Style Sheets, Level 2 (CSS2). The recommended standard has been employed by using HTML code, verifying the transitional HTML 4.01 recommendations. The recommended standard has been employed by using HTML code, verifying the transitional HTML 4.01 recommendations. In the case that a user enters the website through a browser that does not support CSS, the structural framework allows for correct viewing of all content. The website's links incorporate clarification of their destination and provide information about whether they will open in a new window. Allows font size to be selected to make reading the screen easier, scaling the website and all of its components. This does not apply to the infoEnergia service accessible from the customer area. The Online Office (including its demo). PDF documents from before March 20th, 2007.
infoEnergy: although almost the entirety of the content of the service is accessible, you might find it difficult to access comparative consumption graphs. These problems will be rectified in the near future. In general, Endesa Customers is compatible with the current version and with the primary previous versions of Chrome, Firefox, Internet Explorer and Safari.